Nan A. Talese, 9780385513654, 480pp. Frances Perkins is no longer a household name, yet she was one of the most influential women of the twentieth century. Based on eight years of research, extensive archival materials, new documents, and exclusive access to Perkins’s family members and friends, this biography is the first complete portrait of a devoted public servant with a passionate personal life, a mother who changed the landscape of American business and society. Frances Perkins was named Secretary of Labor by Franklin Roosevelt in 1933. As the first female cabinet secretary, she spearheaded the fight to improve the lives of America’s working people while juggling her own complex family responsibilities. Perkins’s ideas became the cornerstones of the most important social welfare and legislation in the nation’s history, including unemployment compensation, child labor laws, and the forty-hour work week. Arriving in Washington at the height of the Great Depression, Perkins pushed for massive public works projects that created millions of jobs for unemployed workers. She breathed life back into the nation’s labor movement, boosting living standards across the country. As head of the Immigration Service, she fought to bring European refugees to safety in the United States. Her greatest triumph was creating Social Security. Written with a wit that echoes Frances Perkins’s own, award-winning journalist Kirstin Downey gives us a riveting exploration of how and why Perkins slipped into historical oblivion, and restores Perkins to her proper place in history. KIRSTIN DOWNEY is a frequent contributor to "The Washington Post," where she was a staff writer from 1988 to 2008, winning press association awards for her business and economic reporting. She shared in the 2008 Pulitzer Prize awarded to the" Post" staff for its coverage of the Virginia Tech shootings. In 2000, she was awarded a Nieman fellowship at Harvard University. She lives in Washington, D.C.
"Kirstin Downey has given us a rich, nuanced portrait of one of the most significant figures of the Age of Roosevelt. Frances Perkins has fallen out of the popular imagination; this fine book should do much to rectify that, and bring the first female member of a president's Cabinet to vivid life once more." 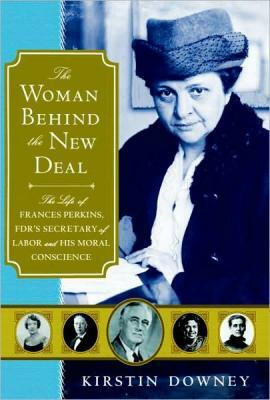 "The New Deal was a big deal for America—and, as Kirstin Downey shows in this illuminating and sparkling book, Frances Perkins, my predecessor as Labor Secretary, was the moving force behind much of it. Her legacy included Social Security, unemployment insurance, and other initiatives that have improved the lives of generations of Americans. With wit and insight, Downey recounts this singular woman and invites us to celebrate her life." "For his presidency to succeed, FDR needed a strong labor secretary to restore jobs and confidence. Perkins was that loyal lieutenant, as well as his unrelenting prod and social conscience." "The story of Ms. Perkins turns out to be, in the sympathetic hands of Ms. Downey, a remarkably good read, surprisingly full of dramatic twists despite that motherly hat and low-profile manner." "Downey's biography traces Perkins's career from its beginnings…and vividly conveys her subject's determination and political savvy…. Her contribution to American history has often been overshadowed by the criticism she drew as a woman in power." "The current economic woes have, among other things, focused attention once again on the New Deal. Books about the economics, the politics and the personalities of the time have surfaced. Still, as a new book by award-winning business journalist Kirstin Downey suggests, one of the most influential figures in shaping the New Deal turns out to be a name few know today—and turns out to be a woman. Eight years of research, new documents and interviews with family members were among the many sources Downey drew on for her new and compelling portrait of The Woman Behind the New Deal." "Excellent… It's a provocative title, but Downey convinced me that Fannie Perkins, of Beacon Hill, Worcester, and Mount Holyoke College, was the woman behind the New Deal. She was certainly the Cabinet member most directly involved in creating the Social Security Act, and a key champion of the National Recovery Act and the Civilian Conservation Corps… Her book could not be more timely." "There's a fair amount of disagreement among historians about who in the New Deal was responsible for which successes. Downey makes a persuasive case that Frances Perkins, more than any other single individual, was the driving influence behind the creation and design of both the Social Security Act and the Fair Labor Standards Act." "...Reading the biography of FDR's Labor Secretary Frances Perkins brings to mind the old saying about how Ginger Rogers had to do everything Fred Astaire did, except backward and in high heels. Perkins, the first female Cabinet member, not only had to do more than her male counterparts to prove herself, she had to do it while dealing with rough-and-tumble labor leaders, a husband in and out of mental institutions, condescending bureaucrats and some Congress members hellbent on impeaching her. Perkins would have notched a place in history simply by taking the job. But she earned it through a jaw-dropping number of accomplishments. Perkins took a major role in shepherding through Social Security, unemployment insurance, child labor laws and the minimum wage." "No individual—not even Eleanor Roosevelt—exerted more influence over the formulation of FDR's New Deal or did more to implement the programs than Frances Perkins (1880-1965). As former Washington Post staff writer Downey makes plain in this deeply researched biography, the first female Cabinet member was the primary shaper of such new concepts as unemployment insurance, the 40-hour work week and—last but not least—Social Security. At a time when the United States stands at the brink of another economic meltdown calling for sweeping federal interventions, Downey provides not only a superb rendering of history but also a large dose of inspiration drawn from Perkins's clearheaded, decisive work with FDR to solve urgent problems diligently and to succeed in the face of what seemed insurmountable odds. Confronting family issues-a frequently institutionalized husband with severe psychiatric problems; a deeply secret lesbian relationship with Mary Harriman Rumsey (sister of Averell Harriman); a daughter from whom she was often estranged-Perkins nevertheless exhibited tireless grace under pressure again and again, always rising to the occasion in the name of every and any progressive cause." —Publishers Weekly, starred review and "Pick of the Week"
"[Downey's] impressive ability to bring these...New Deal figures to life reminds us that administrations are made by more than the great man—someday it will be a great woman—elected by the voters.... [Downey has] made an important contribution by introducing readers to [a] woman who...made a New Deal that continues to set the standard for overcoming a national economic crisis." "Prize-winning journalist Downey deconstructs the life of a passionate labor advocate who became the nation's first female Cabinet member. Frances Perkins (1880-1965) had clearly delineated goals: reasonable working hours and wages, fire safety, improved working conditions and the end of child labor. Displaying the fortitude and prescience that carried her through three decades of public service, she outlined these during her first meeting with FDR. After being named his Secretary of Labor, she went on to accomplish reform of unprecedented scope. The 40-hour workweek, unemployment insurance and Social Security are but a few of her legacies; her storied relationship with FDR is another. Making excellent use of personal papers and of archival materials that include a 5,000-page oral history, Downey allows Perkins to narrate much of the text, giving new life to this often overlooked historical figure. FDR saw something special in Perkins, and his confidence and support helped her endure years of sexism from fellow Cabinet members and unwarranted criticism from the press. She developed keen insight into the process of successful lawmaking and established a deliberately staid work persona as a 'plain, sturdy, dependable woman' that allowed her to exert authority and demand respect on her own terms. Married to a man institutionalized with mental illness, she kept her unhappy personal life out of the papers and away from Washington, stifling her emotions and dedicating herself fully to the country's problems. At times it seemed that FDR involved her in every major policy decision. Perkins essentially authored the New Deal; she handled immigration during the onset of World War II, bending rules to harbor German Jews; she worked to establish fair hearings against suspected communists. Her entire career was devoted to the principals she espoused in 1913: 'It is human life and happiness which we are trying to save . . . this is the most important thing.' As a progressive president again takes office in a time of economic crisis, Perkins offers a vital role model." "Kirstin Downey gives Frances Perkins the biography she deserves, the story of a fierce advocate who put people first, a public servant who was actually worthy of the name, and a bracing reminder of what inspired government can do. Perkins ignored the glass ceiling and change America. This book is a joy!" "For all of her apparent modesty and fierce sense of privacy, Frances Perkins wanted to be known by posterity for her contributions to FDR and his New Deal, particularly Social Security. An investigative reporter, Kirstin Downey has uncovered Frances Perkins's extraordinary strengths in shaping and securing the central domestic accomplishments of the New Dealers. Despite continuing impediments, Perkins, a social worker, successfully broke into a man's world and was a major player for all 12 years of FDR's administration. Downey deftly links the Progressive movement of the early 1900's with the reforms Perkins helped FDR achieve, particularly in his first two terms. In Downey's skilled hands, Frances Perkins at last emerges as a pivotal figure in the most transformative twelve years of 20th century American history." "Downey brings some much-deserved attention to this political pioneer in The Woman Behind the New Deal… She presents a balanced picture of the woman who changed the conditions for working America. The average working person today owes a debt to Frances Perkins, and she certainly deserves to be better known than she is." "[An] important biography…. [Downey] has done political history a service simply by pulling together what is known, and adding what's been hidden." "Downey's detailed account of Perkins' life pays equal heed to the moral force of her convictions and the canny political maneuvering required to give those convictions the force of law in a time of national crisis. We can only hope that her spiritual successors are assembling in Washington today." "This biography of Perkins by Kirstin Downey reads like a novel. It's a detailed account of Frances Perkins' life, her accomplishments and, in particular, her relationship with FDR, but it's more than that. It's also a riveting historical account of the times, eerily similar to today, as seen through the eyes of the only woman in Roosevelt's Cabinet." "This is a penetrating and readable biography that takes a big step toward restoring Perkins to her proper place in history." "[This] is more than a biography of an extraordinary woman. It is a window to another time through which we are able to observe the birthing pains of reforms we now take for granted. And yet, although the author makes no comment on the current economic or political situation, many passages dealing with the Great Depression, immigration and the impending world war could have been lifted from today's news. As much as The Woman Behind the New Deal informs us, it also serves as a reminder of ties that bind us to a bygone era." "Downey is an exceptional writer and recounts the story of Frances Perkins with verve and elegance."